One of the best ways to travel in the city is by means of a comfortable car. So Volkswagen Phaeton Car rental Bangalore is growing within the city to the extent that it is much easier to get an automobile of your choice and luxury,Here is the car rental tariff for car hire in Bangalore, we have the cheapest tariff for Volkswagen Phaeton Car rental in Bangalore, we have been providing car rental service from past 15 years and have hundreds of happy customers all round the world , so feel free to book a taxi from us. 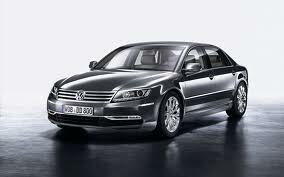 Leading luxury car manufacturer Volkswagen has launched its luxurious sedan model Volkswagen Phaeton in Indian market. The Volkswagen Phaeton will be build on the same platform which is used to build Audi A8. Volkswagen Phaeton is the excellent combination of higher standard materials, new cutting edge technology and exceptional designs. Volkswagen expects potential in Indian auto market and it decided for the number of launches in Indian market that will include Volkswagen Phaeton in premium sedan segment, Volkswagen Beetle in premium hatchback segment, Volkswagen Polo and Golf in in mid-sized hatchback segment, Volkswagen Toureg in premium SUV (Sports Utility Vehicle) segment and Volkswagen Tiguan in compact SUV segment. As we already discussed that Volkswagen Phaeton will be available with two different capacities engine in both petrol and diesel trims that delivers different level of power and performance. First one is the diesel variant which will be packed with 3.0L, 2996cc V6 TDI diesel engine with six speed automatic tra nsmission gearbox that produces maximum power of 240PS at 4000rpm with 500Nm of maximum torque at 1500rpm. Second one is the petrol variant of Volkswagen Phaeton which will be powered by the 6.0L, W12 petrol engine with five speed automatic transmission gearbox that delivers more power and torque in comparison to previous variant and it produces maximum power of 450PS at 6050rpm with the maximum torque of 560Nm at 2750rpm. 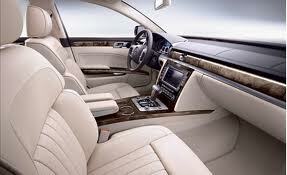 The front wooden centre console present in the Volkswagen Phaeton offers a very impressive and stunning interior look. The theatre style interior illumination with illuminated key ring offers a very superior unmatched interior to the car. The inner side door trims in beige color enhances the overall interiors of the car. The tilt steering wheel with leather cover and the leather wrapped Gear knob gives a very classy look to the interiors. The shinning effect of the car is met by room lamp, trunk light to give the ambience a very stylish and touch of elegance. Some of the advanced interior features available in Volkswagen Phaeton are 2 DIN audio systems, Sun visor, Air Conditioner with heater, Automatic Temperature Controlled. 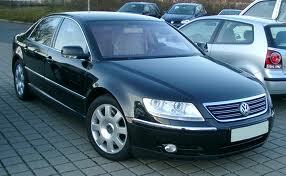 The most popular SUV Volkswagen Phaeton is a very safe car that is packed an ultima te braking system. Volkswagen Phaeton will be available with both petrol and diesel trims. Its diesel model will be packed with 3.0L, 2996cc, V6 TDI diesel engine with six speed automatic transmission gearbox that will offer mileage 8.3kmpl mileage in urban traffic while on highway it gives mileage 12.8kmpl. On the other hand petrol variant of Volkswagen Phaeton which will be packed with more powerful 6.0L, W12 petrol engine with five speed automatic transmission gearbox offers mileage 4.7kmpl mileage in urban traffic while on highway it will give mileage 8.5kmpl. A Tour to India in Volkswagen Phaeton is one of those experiences that you do not forget anymore,Find the perfect holiday destinations in India and enjoy some relaxing time off from your daily routine! Historical monuments,foggy hill stations, golden deserts, pilgrimage sites, captivating beaches, serene backwaters, rich wildlife and colourful fairs, India is simply exotic and magical (Volkswagen Phaeton Rental Bangalore). Volkswagen Phaeton Time and kilometers will be charged from garage to garage. Volkswagen Phaeton Services for more than four hours will be charged under 80 kilometers and 8 hours. Volkswagen Phaeton All parking charges, toll taxes, state taxes will be charged extra as per original receipts, in case taxes are paid in advance of any state 1/3rd tax will be charged of actual receipt. Volkswagen Phaeton Service tax will be charged. Volkswagen Phaeton Once the vehicle leaves our garage, we will be charging for the same irrespective of being used or not.